Love remains the greatest power of all. With loving comes forgiveness and acceptance of one another’s differences. If our world leaders could operate from love and acceptance rather than greed and blood-thirst this would be a much better world to live in. 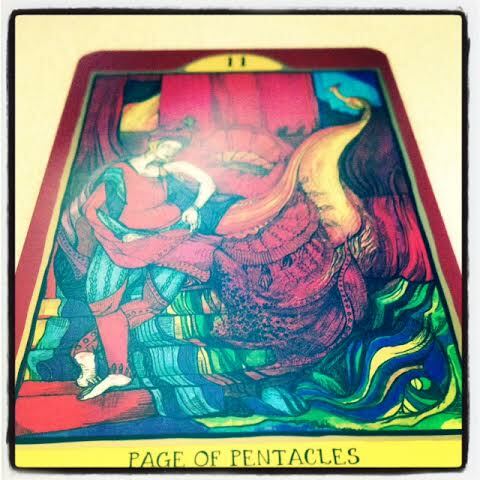 The Page of Pentacles represents the student to me. This is very fitting as I see myself as a perpetual student learning from the world at all times. 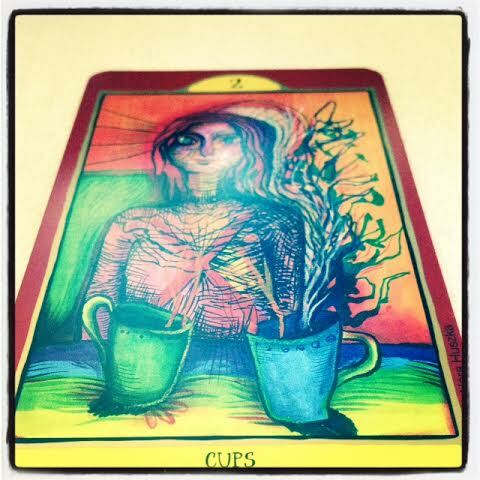 For me the Two of Cups speaks of equality and mutual respect. I have finally honoured my inner artist, the intuitively creative me that is well represented by the Cups suit, by enrolling at Art School at the mature age of 51. I’ve loved art since I was a little girl, and I’ve wanted to ‘do’ good art since just about forever. It is never too late to honour oneself and to treat ourselves as deserving equals. With Art I can express myself. The written and spoken word. 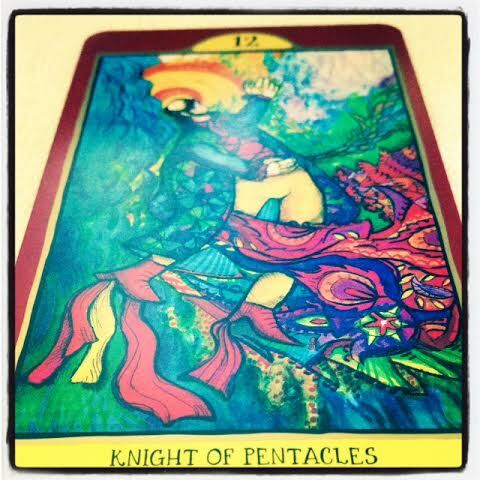 I’ve been fortunate that I had a very busy tarot practice until quite recently. It brought me great joy to witness the healing and peace that my readings often brought others. I’ve also just completed my first contracted book for publication by Schiffer Publishers, a how-to manual for my LeNewbie Lenormand deck. Hopefully my written words in this publication will be a gift for those who are new to the oracle. For me, this card is all about responsibility and planning ahead. I guess I’d say that good planning and foresight will assist each of us to meet our responsibilities toward ourselves and others; not only over the season, but into 2015 too. Happy holidays to us & ours, including all our fur (and feathered) babies. As the world seemingly becomes more troubled before our eyes some of us might be wondering, where is God? God, by any and all others names; the Creative Source. I learnt that sometimes all it takes is to ask. So I did. God is as present in our DNA helix as in the great sand dunes and in the microscopic life beneath the ocean. In geometry, in negative space, in the thunder and in the skin of the reptile. Every fibre, every cavity, every frequency and all reflections of these is where God is. In the pallet of the artist, the delicate balance in contrast, in science and in nothingness. In the shadows and their vacancy. In all things is the spark of divinity. It is impossible to not see God in all things. All things are a reflection of all that is. All that is exists in multiple dimensions, all at once. What is considered to be grotesque in one realm is revered in another; for all that is is divine. We catch but fleeting glimpses of creation in our world. As divine creation expands outward so too does it contract inward, a column and circle all at once. Many and one in the same moment. From our perspective we sometimes see God as the object, sometimes as the negative space surrounding the object. There are no mistakes or miscalculations, this is not possible in the constantly evolving dance of creation. Where do we find God? Where our attention span takes us, for nothing is devoid of the creator. We witness its endless birth in all that is, in all that we perceive to be missing and present. Like eternally wet paint on the artist’s canvas, creation is never still or stagnant, always moving, always blending, running, smudging, creating new blends, new experiences – all for our benefit so that we may see divinity reflected back to us and recognise ourselves in all that is divine, all that is. We think God is only ‘good’ or ‘just.’ God is everything, everywhere. Nothing can exist without the particle we call God. When we see that there is no division, no lack, no right or wrong, we recognise the splendour of unity, the wonder of oneness. Then we begin to recognise ourselves as God. However, it is our destiny to always seek divinity just as we are divinity, therein lies the great paradox. God is the eye that sees the object and the object that is seen. God is the reflection of the object on the optic nerve and God is the optic nerve. The space between viewer and object, the point of connection and separation, the manifest and non-manifest. The overseer in the unseen as well as the seen. The apex and the nadir. The shadow, the suggestion, the cause and the effect. The near, the far, the origin and the offshoot. All these things are one expressed in infinite ways. Seek God in contrast. The space between spaces. Moving as one organism on its own dance, perfectly choreographed. To see God as only one thing from only one perspective limits our ability to see the dance as a whole of which we are both part and total. Eyes open or shut, nothing is not God. An endless dance. Never the same. Always in the process of creation. That is God. Something I wrote in 1998 for Nelson Mandela. Hamba kahle, Tata Madiba. of the black nation, for humanity. until the end, was what he taught. while in the gaol. The time was due. to hear the crowd sing out aloud. sing with pride and merriment and mirth. like you and me, our common goal. this is our cue, this is the hour. with dignity, in this our land. we shall protect, grow and thrive. in Africa that we are freed. Little Madeleine McCann, eldest daughter of a British couple, disappeared days before her fourth birthday on May 3rd 2007, from a holiday resort in Portugal. Her parents and their friends were enjoying dinner at a nearby tapas bar while the children slept, during which time Madeleine disappeared. I did a Grand Tableau to find more information surrounding her disappearance. *Disclaimer: Nothing here is presented or intended as fact or actual knowledge of what happened, it is merely how I interpreted the cards in the spread above. Method: Grand Tableau using a Chaining/Linking technique. The Child was told that her parents reputedly ‘gifted’ her to them by invitation, and possibly for financial reasons, when she was stolen by a repeat offender, a man who was part of a circle that pretended to be her extended family. There were discussions to confine her under lock and key until the dust had settled. The network (syndicate) responsible for her abduction operated under obscurity and secrecy to finalise the kidnapping. Under the guise of ‘caring relatives’ they took her (relocated her) to a woman, transporting her by sea, and delivered her disguised as a boy with forged documents to be passed off as someone else’s child. The abduction was premeditated as it happened after repeated discussions with a man, connected to a human trafficking ring that has been in existence for many years. They have an extensive communications network that is tightly contained, accessible only through a deep underground movement where such abductions are plotted. Shrouded in obscurity and with the aid of secret documents they were able to see the abduction through to its conclusion, ensuring no trail was left. This abduction was emotionally motivated by ‘family connections’ ensuring the child was delivered to a woman abroad who then transported her by car to a hidden location where they wouldn’t be exposed. Documents were exchanged regarding ‘parental’ rights (possibly with inside help from some official) ensuring the child would not be recognised. This child was specifically chosen for her appearance (beauty) and money was exchanged for the abduction. It appears as if they kept the child in a fortress that had several exit routes to make their quick escape if necessary. The venue is possibly in a mountainous terrain or near a large mountain range, and/or behind high walls. If you’d like to know how I saw what I did in the cards, or if you’d like to learn to read the cards too; join me at my free lenormand study group Lenormand Toolbox on Facebook. 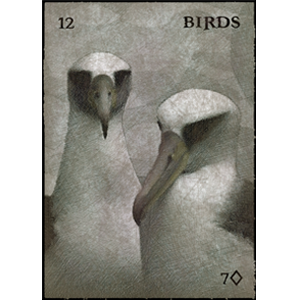 A group for beginners and advanced students of Lenormand. Samhain Blog-Hop: How do I love myself? 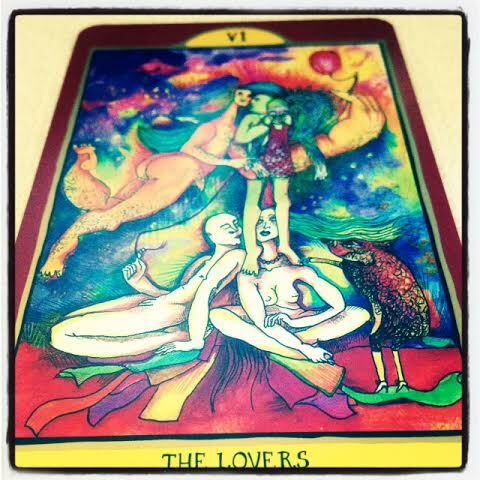 I am honoured to be part of the Samhain blog-hop, the theme this time is LOVE. 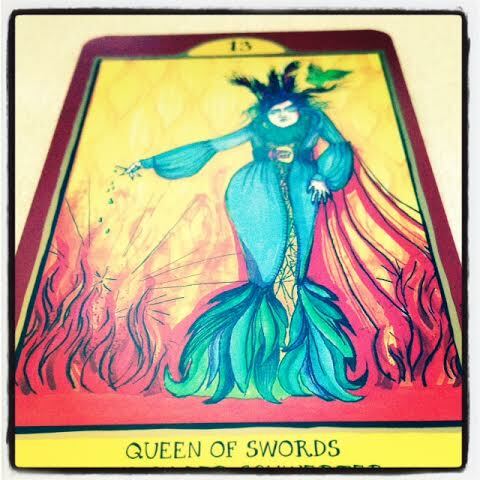 My post links here to Ethony (the blogger before me;) and here to Sun Goddess Tarot (the blogger after me.) Continue to read each of our thoughts on love by clicking on these links. From their blogs they will direct you to the next blogs in the Samhain blog-hop. If however Mercury Retrograde decides to play havoc with any of the links in the chain, fear not, here is the Master List. (1) I acknowledge that my relationship with you has been riddled with disease, crippling me to believe that I am not as worthy as another. Confining me to that stuck place where I am confronted with my imperfections. A tomb that whispers ‘if I can see how unworthy you are, surely everybody else sees this too?’ I fear these thoughts that weigh me down seem utterly beyond my control. (2) But… I acknowledge too that I am in partnership with myself, however I approach this we’re in it together. I may as well stop the merry-go-round for long enough to make a promise to me; a promise of commitment – come what may. (3) In doing so, what may come is a new message of love. A renewal of my core relationship; a relationship that touches and colours all other relationships in my life. (4) I accept the invitation to seek the beauty and value in me. I know it has always been there even if I’ve temporarily lost sight of it. (5) I acknowledge that my issues of low self esteem are deeply rooted. It seems I’ve carried the weight of this through generations almost as if my imperfections are imprinted on the DNA of my psyche. (6) But, I also acknowledge that I need to make an effort to be truer to me, the real me, and to trust myself to be a loyal companion who can see beyond the genetic imprints until I remember that I have always been my own soul-mate, even before I chose this life, these generational lessons. (7) It is then that I will be free to enjoy the abundance of who I am. To frolic again in the flow and to see hurtful experiences and perceptions as nothing more than yet another resource, one of many to add to my coffer. (8) For, wherever I travel, whatever distance I cover in this life or another on these or other foreign shores, I know that I am the rightful heir to my unique connection to Source – my own spark of divinity. It is my inheritance. (9) I will travel beyond the shores of my physical experiences, I will heal my sense of discomfort and ill-worth, and I will recognise myself as one who has been on this journey a long time, much longer than my physical age. From this day on I will be my own champion, my own best friend. I will endeavour to remain in the flow of abundance from which I was conceived. (10) Dear Self, my journey has not stalled, I am merely setting down roots for a while as I learn about love and relationships in this physical world. I allow the roots of my tree to dip deeply into the flow of consciousness, and I pause often to quench my thirst. (11) I have me, my best friend, to face the rest of this journey with. As long as I trust that I am exactly where I need to be and that soon enough my ship will sail on to new shores, we might as well enjoy the process together. (12) I can only love another in so much as I have learnt to love myself. I no longer struggle to swim upstream, I surrender to the flow. Suddenly I find I no longer need permission to love because this love doesn’t come with a price tag that says ‘you’ve gotta love me back.’ I’ve let go of the notion that I am any less deserving than another because I know this is not true. We’re all cut from the same cloth, fishing from the same pond. I think I’ll spread a picnic blanket now, catch some sun rays and allow myself to feel totally at one with all I am, all I ever have been and all that I am becoming. To learn to read Lenormand cards, subscribe to my blog, where regular posts on Lenormand (and Tarot) are blogged by me (Rootweaver) and a host of other guest bloggers. Lenormand Notebooks, how do you organise yours? My Lenormand notebook’s belly is starting to feel quite full lately! After initially resisting advice to begin my own notebook (for reasons unknown) I can now see why this is such an important exercise. The Lennie nerd in me is even having fun finding adjectives to describe and modify my subject cards! LOL! 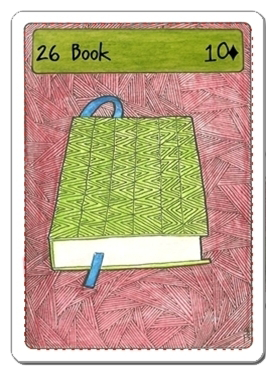 How is your Lenormand notebook coming along? Do you have any useful tips to share? If you are anything like me, you too have been wondering how to predict timing, using Lenormand. I may have good news. While this suggested timing method has not yet been tested, it seems to deserve some mention, at least worthy of trying out. 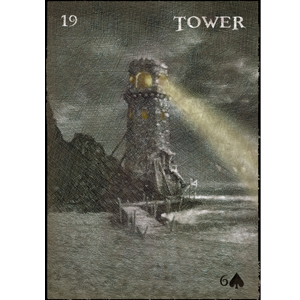 Several highly respected Lenormand readers have ascribed timing to some of the cards, but the problem I have with some of these is (at best) there seems to be a lack of consistency, and (at worst) the information is often conflicting. Flechter for example suggests that the Tree card indicates a period of one year, yet Channah suggests five years for the same card. 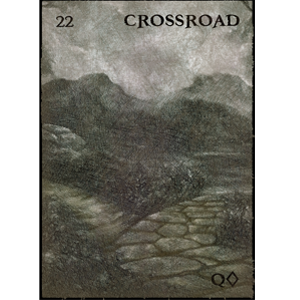 Besides, I have come to realise that Lenormand rarely looks at events that far into the future; if these were months instead of years I’d probably be more inclined to adopt one of their approaches to timing. Another conflicting timing card is the Coffin; Kirsch says it means ‘forever,’ Flechter says it means ‘eternity’ yet Channah & Treppner suggest that events will take place ‘immediately.’ There are a number of examples where currently available information is either conflicting, confusing (for me) or set in terms of unrealistically long periods of time. I deeply respect their work, and I’m sure that many have been able to use their timing suggestions successfully; sadly I have not yet had the same success. However, timing is always a tricky thing in divination. I do recommend that you examine their timing methods thoroughly though, perhaps you will have more success with these than I have had. Remove the following 3 cards from your standard 36-card Lennie deck; Clover, Bouquet and Lily. I chose Clover to represent hours as it traditionally indicates a quick event, quick opportunities that end quickly. I chose Bouquet to indicate the days & weeks as flowers usually blossom in a few weeks; and I chose Lily to represent the month because it indicates maturity, something that might take a little longer. Divide the remaining deck into 3 equal piles of 11 cards each. Add the Clover card to the first pile, the Bouquet to the 2nd pile and the Lily to the 3rd pile. Shuffle each pile thoroughly. The first pile will be cast on the top row of the spread or casting sheet from 1 to 12 across. The 2nd pile on the second row and the third pile on the third row. If this was a real reading, the timing information obtained from this method would indicate that the event should take place at 6:00 (am/pm) on February 20th, 2014. Is it accurate? I honestly don’t yet know. I’ll have to try it in real-time situations a few times to determine that. In the meanwhile though, there is no harm in testing this timing method and having fun with it. I hope you’ll give it a try too.